LOL yup been there done that! I think my crew has fine tuned that problem, cause now in the chalk department of the trailer its clearly labeled blue or red with sharpie arrows pointing to the extra chalk lines. Location: Help I'm stuck in Michigan! Not here, not ever. Compromising safety that way is just plain stupid. do you hold the saw till the blade stops spinning every time you use it? YNYAF when you know how to cut with a worm drive with the blade guard still on. you still have a splinter in your gut from 30 years ago. ynyafw you go to the porta with two blocks of wood for your own personal toilet seat. No...I've never removed them but we used to wedge them up....you either hang them on a nail in your horses or set them upside down. Last edited by 413Sean; 06-28-2013 at 10:35 PM. Ill still wedge if a specefic situation calls for it. Back then...my first framing job in indianapolis all the saws were always wedged up...same as when I moved to Memphis a year later..ALL The crews kept their blades wedged. In hindsight I believe its because all our roofs were compex cut up rafter framed monsters. 4-8, 000 sq ft customs with 4, 5, and 6 stall garages. Multiple bays and coffered celings galore. To this day , 13 years into construction....the best 2 framers I ever worked for were the first 2. I've did it once...on the slab though. Yep. I'll use a pencil to wedge it if I need to, but it's pretty rare. On the crew I worked on we pinned them for years, but when I started working for myself I decided to leave them down. I don't even think about it anymore. Guard doesn't get in the way at all. Unless you're cutting an angle. How often do you cut an angle or tilt the table? Not advocating the removal of guards. Some people (like my nephew) should not handle a skil saw at all. They're the ones I worry about. ykyafw your model 77 has a skyhook. Sounds like you need one of these, my friend. What is that thing on the side? 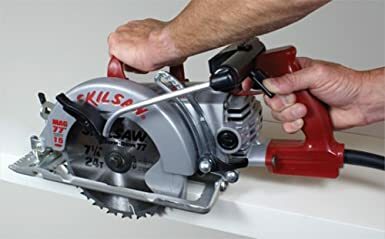 I have 2 saws with that setup, and they are the first two I always reach for. I haven't had to pin a guard since I got those things.